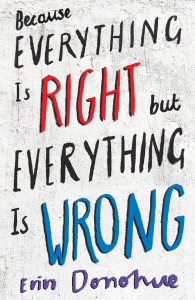 For the last week of May, Erin Donohue’s debut novel Because Everything Is Right but Everything Is Wrong will be available to purchase on Amazon for $1.14. Click here to take advantage of this amazing price. Erin recently took part in the Auckland Writers Festival on a panel with Guardian Fiction Prize winner Alex Wheatle and Eileen Merriman called Can We Be Frank? which explored the difficulties of writing about big issues for a younger audience. This ebook deal will last until midnight on May 31st.